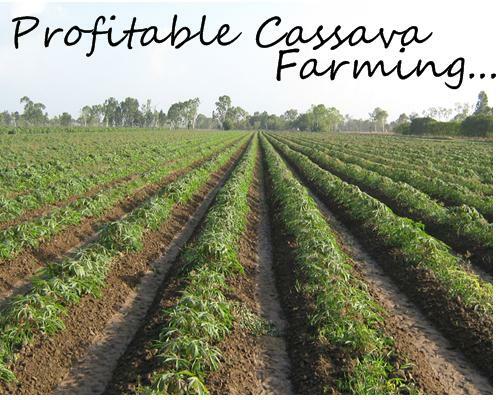 Here lies all you need to know about profitable commercial cassava farming in Nigeria. Commercial cassava farming has been a very profitable farming venture for Nigerian farmers. Cassava tubers which is in very high demand is the raw material for producing 'garri' which is a staple food for the Nigerians. 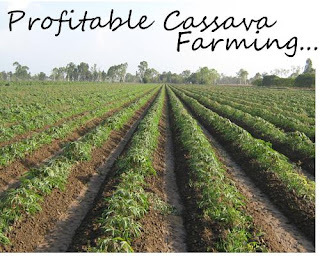 Cassava farming venture is known for its low input- high output nature. Many industries in Nigeria use cassava as a major raw material so you don't have any trouble selling your products. A cassava farmer will never have problem selling his products quickly and profitably. Cassava is one of the easiest crops to cultivate as it does not require sophisticated environmental conditions. Cassava is very much adaptive to climate change as it can resist high temperature, drought. Cassava grows well on all types of soil with an exception of heavy or saturated soil. Though it gives preference to light, well drained and deep soil rich in organic nutrients. Cassava is tolerant to high temperature as it thrives well on tropics and sub-tropical regions. It tolerates long dry seasons (6 to 7 months) as well as reduced rainfall. Cassava is very good at weed control because ones the plant is around 6-7 weeks, it already forms canopy with its leaves, therefore, considerably reducing weed emergency. Thus reducing cost of weeding and herbicide application. Also due to its hardy nature, cassava does not require irrigation facility as it can adapt and tolerate adverse weather conditions. Low input of time and resources. When selecting cuttings, the best varieties of cassava to plant are those that are rich in dry matter, which is well adapted to the production area. These are the varieties that produces tubers early, and which are easy to process. Cassava cuttings are usually collected in the field during harvesting. Improved varieties may also be obtained from research institute or appropriate development organizations. Cuttings of 20 to 30 cm long from the central portions of the brown healthy stems at around 8-12 months old are considered and preferred to be planted. Avoid any significantly hardened or tender stems. Healthy crops can be identified by their strong stems and branches, lush foliage, stems and leaves showing little damage from diseases or pests. To ensure reasonable yield and uniform growth, it is advisable that the stems should be harvested at about a week before setting and store them in the shade, in a well-ventilated area. The cuttings should be taken at the time of planting or on the day before. Each cutting should have 5–7 dormant buds. Fertilization or manuring is not necessary on a virgin or long-term fallow land. Organic fertilizer, like farmyard manure, is recommended for the production of tubers. When preparing the soil for planting, add chicken litter or any other animal manure at a rate of 10 tonnes per hectare, or 15 or 20 tonnes per hectare if the soil is depleted. Planting should be at a density of between 6,000 and 10,000 plants per hectare or with a spacing of between 1.5 x 1 m or 1 x 1 m for single cultivation and 2 x 2 m with intercropping, or 2,500 plants per hectare. Cassava should be combined with other crops to improve agricultural profitability and soil quality. Because of the nutrients they release into the soil, legume species such as cowpea, beans and groundnut are particularly suitable. Cassava can also be combined with maize. The cuttings are planted horizontally, diagonally or vertically, with one or two cuttings per placement. The best method is to push them in sideways up to ¾ of their length, with the knots pointing upwards. Positioning the knots upside down reduces the yield. Planting sideways favours the consolidation of the roots into one area and results in a grouping of tubers, which makes harvesting easier. Pest and diseases are a major factor to be considered in successful cassava farming venture, there is no way a farm would not encounter these threats. However, there are approaches to mitigate the effects of these factors. One of which is the use of resistant varieties of stem cuttings. There are improved cassava stem like the TME 419. After about 12 months of planting, the cassava is ready for harvest in some varieties, though some are early like 10 months. The dry season is the best time to harvest cassava because the tubers are rich in starch at that time, drying is easy and the products can be easily processed and preserved. The harvest involves cutting stems at a height of 25 to 34 cm from the ground using a machete and removing the tubers, making sure not to damage them. This can be done by hand if the soil is light or using a hoe, a stick. The yield varies from 20 to 30 tonnes per hectare for local varieties and from 25 to 70 tonnes per hectare for improved varieties. In hostile environments where other crops fail, cassava can provide good yields. In typical conditions, the yield may vary between 8 to 15 tonnes of tubers per hectare. Considering the ease of cultivating cassava, reduced inputs, hardiness of the cassava plant, and also its high market demand, cassava farming is conclusively the most lucrative agribusiness for all and sundry. I'm doing Cassava farming this month. Are you? Your comments are much appreciated. Try to look for farming communities, seek for the community head and ask for land to be leased to you farming. Alternatively, you can go through the Local government secretariats. They should connect you to communities that will lease farmlands to you or they will even allocate land to you.